Join us, the Vunetrix team, at The SMART AIRPORTS & REGIONS(SA&R) Conference & Exhibition in Edmonton Alberta, July 23rd – July 25th. This is the premier event covering how SMART Airports and their adjacent Regions are leveraging “Connectivity” to stimulate “Innovation and Opportunity”. 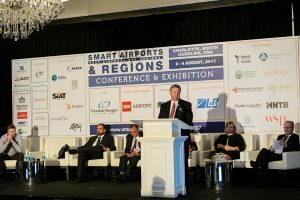 During this three day event, industry experts and airport delegates will explore the catalytic effect and critical success factors covering the economic development ecosystem of SMART Airports and the Regions they serve, integrate, and connect with. SA&R focuses on SMART strategies, opportunities and innovations that development, design, technology, and the Internet of things is bringing to environments, communities, and cities around the world. Why is Vunetrix sponsoring SA&R? Upon recommendation of industry expert and consultant Dominic Nessi, Vunetrix will introduce a much needed tool for the Airport industry. Since the digitization and introduction of Modern Security Systems, Airports have been experiencing a serious problem. Their IP security infrastructure is susceptible to failures and performance faults. What’s more, these failures often go undetected. And, when a security event occurs, critical equipment isn’t working which further complicates the situation. Upon this basis, Vunetrix went about creating a software application that would reside on an Airport security network and monitor the performance characteristics of all IP connected devices and applications. It was our mission to design a tool that would provide Airport Security Teams with proactive alerts about health and performance anomalies related to all of their IP security technologies. In addition, with Vunetrix in place, Airport Security Teams have an all-in-one solution for managing their entire infrastructure across the geographic expanses of an Airport’s real estate. They can view the health and performance status of cameras, VMSs, servers, switches, UPS batteries, emergency phones, security doors, and more through a single-pane-of-glass. Basically, any IP device or application with an open protocol can be connected to the Vunetrix SMART Dashboard, and set up for monitoring. The Vunetrix team is looking forward to showcasing our innovative and SMART solution for Customer Safety Advocates and Airport Security Teams at SA&R. If you are interested in learning more about our SMART Dashboard solution for Airport Security Teams and Systems, give us a call. Our dedicated team of physical security practitioners looks forward to working with you to solve your biggest challenges. Contact us today!